As parents, you naturally want the best for your children. An university education will certainly give them a good headstart in life. However, the costs of tertiary education can be hefty and has been rising over the years. For instance, to plan for your child’s entry into a local university, the tuition fees could easily cost around $32,000, which is not inclusive of living costs and other miscellaneous costs which may come up to be another $10,000. 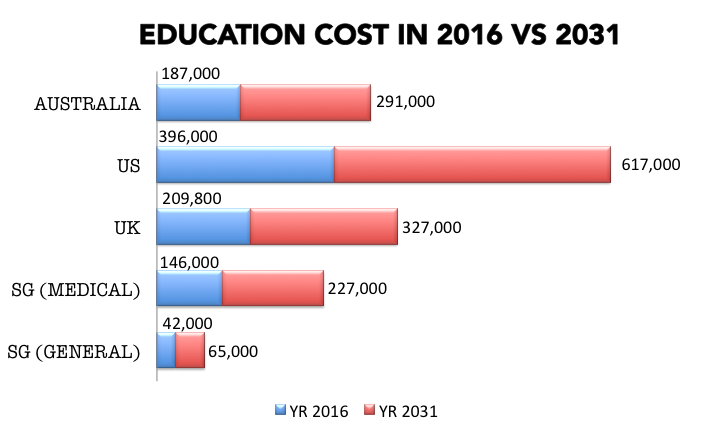 In 15 years’ time, this amount of $42,000 can cost as much as $65,000, assuming inflation for education costs rise by 3% every year. In the event if your child is pursuing a general degree in US, it can cost as high as $617,000 down the road. Therefore, if you like your child to receive good education and not be burdened by study/tution loans, this require some early planning. For education planning, you cannot afford to put your money at risk. Investment into stocks and properties are volatile, and the market may be down at a time when you need the funds. Imagine if your child reaches the age to enter university and there is a deep recession. Not only will your earlier returns be wiped out, your portolio may turn red and suffer a paper loss of up to 60% of your capital. If you do not wish to postpone the age your child receive his/her tertiary education, you will have to force-sell your investments at a loss. On the other hand, if you play it too safe and save all the money meant for his/her education in the bank, there is always the risk of inflation eroding the value of your savings. What will happen in the long run if you consistently earn 1-2%p.a. and inflation stays at 3%p.a.? You will realise that you need to save more and more not just to keep up with rising education costs but also to chase after inflation. Therefore, for the purpose of education planning, we believe you will want to save your money in a manner whereby you know your capital is safe and yet you can earn above the current inflation rate. You will also prefer to know that your savings can only appreciate over time and know with certainty exactly when you can get to take out that money with joy to fulfill that one goal, which is, to see your child through university till he/she wears the graduation hat. Resale endowment policies are basically savings policies issued by reputable insurance companies. The money parked in these policies are safe and are always returned in full with bonuses/interests earned upon maturity. By taking up resale endowment policies, you can be assured that your savings will be earning annual yields of between 4% – 7% which is higher than the current inflation rate. As the maturity dates of Resale Endowment are fixed and known, you can plan for the payout period to coincide with your child’s age to enter university. Resale Endowment Policies allow you to keep up on your savings goal by putting in a upfront lump sum. Compared with taking up a new savings plan, the lump sum which you put in will give a big boost to the policy’s overall returns. It is never too late to start. Let’s work towards your child’s education fund planning.